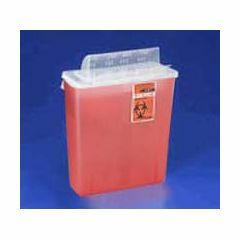 Sharps In-Room Container is an in-Room, multi-purpose sharps collector. Translucent red. 1-piece. Non-sterile. 3 gallon. 16.25" H x 13.75" W x 6" D. Horizontal entry lid. Always-open lids provide for quick and easy disposal. Accommodates larger syringes.